The Adult Choir is the primary choir at St. Joan of Arc Church and features a variety of ages. They sing at the 9:00am Sunday liturgy every week from September to Pentecost Sunday. Occasionally, we will sing at other weekend masses or for celebrations of Sacramental Programs such as Confirmation and First Communion. The Adult Choir serves a delightful Soup Supper in conjunction with our traditional Friday Stations of the Cross during Lent. Rehearsals are bi-weekly on Tuesday evenings (nominally, first and third Tuesday) from 7:30-9pm (7:15-9pm during seasons leading up to Christmas and Easter) with a warm-up on Sunday at 8:30am in Church. Please check the adult choir schedule for the times and dates of rehearsals and masses. Prior choral or other musical experience will be helpful. Training will be provided during rehearsal. We are volunteer and non-auditioned. The average size of the ensemble during the Sunday liturgy is currently 3-4 singers. We always welcome new interest ("if and as you are able") and are very in much in need. We also, and imporantly, welcome gifted instrumentalists including strings, dulcimer, guitar, winds, brass, and percussion. Please feel free to inquire to the Director of Music or to any participant in the Music Ministry for further information or to become involved. The Children's Choir and Instrumentalists is designed for all 1st through 8th graders and includes children from families in the Day School and in the Parish/PSR community. 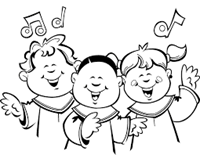 The Children's Choir rehearses a week prior to Christmas and Easter on a Thursday evening from 6:30-7:30pm in Church. The Children's Choir sings at the 4pm Mass in Church on Christmas Eve and at the 12pm Mass on Easter Sunday. The Children's Choir has been used for our celebration of First Communion and a number of our 8th graders have regularly contributed to our celebration of Confirmation. In the past we have worked with a wide variety of musical styles including contemporary Life Teen repertoire for a "Second Sunday" evening mass. We welcome suggestions for engaging materials which speak to our young in worship and ministry. 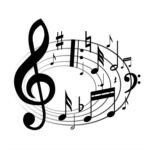 Look for important information in the form of flyers posted under Music Ministry Downloads, PSR e-blast, Day School Parent Bulletin, or announcements at mass or in the classroom regarding opportunities for young singers and instrumentalists. For further information, please also contact the Director of Music or PSR Dir. Sr. Judith Bucco, SND, at officeoffaithformation@stjoanofarc.org. Student cantors and instrumentalists from the St. Joan of Arc Day School join us for weekly Tuesday morning mass at 9AM. If your student is interested in cantoring for the Day School Mass, please contact the Director of Music or our Day School Principal, Mrs. Shelley DiBacco at sdibacco@stjoanofarc.org or at the SJA Day School Office (440) 247-6530, for further information or to learn how to get involved. We need you! The Resurrection Choir consists of those who have mornings free, as our parish funerals are generally scheduled at 10:00am, 11:00am, or 12:00pm weekdays and Saturdays. As one might expect, the group features predominately retired persons and it is a wonderful opportunity to aid the grieving in their hour of need. Members of the Adult Choir participate in the Resurrection Choir as well. Members on the Resurrection Choir roster will be contacted by our Director of Music at the time a funeral is scheduled and are expected to meet fifteen minutes prior to the scheduled beginning of the funeral in Church. Ensemble size varies with each funeral liturgy depending on availability and tends to be 2-3 people. The Cantor Guild consists of animators/singers from our choirs who have a special gift of leadership. They sing at regularly scheduled weekend liturgies throughout the year. We currently feature 4 people on our cantor roster and always welcome new interest. Cantors, please check the Cantor Schedule, Liturgy Sheets, and Music Ministry Downloads for preparatory resources, times and dates you are scheduled to sing. Members from the Adult Choir and Parish community serve on the Liturgy Committee which meets approximately once every four to six weeks. The role of the Liturgy Committee is to plan well in advance for our weekend liturgies and any other Holidays and Holy Days. The Committee also serves as a liason and consultative body between the Parish and Director of Music. The size of the Liturgy Committee is currently 3 people and has, in the past, reached 5-6 people. Anyone interested in serving on the Liturgy Committee and sharing your perspective on how to enrich our liturgical life as a Parish is welcome to speak with the Director of Music or any committee member on how to become involved.